Seattle Seahawks fans didn’t have much to smile about after seeing their team lose to the Carolina Panthers Sunday. But a five-year-old fan did have a grin with a gap after his own personal loss during halftime of the National Football League play-off game. He lost a tooth. Leo Deveraux’s loose tooth had been bothering him while watching the game on television at home. During the break, his dad tied one end of a string to Leo’s tooth and the other end around a football. 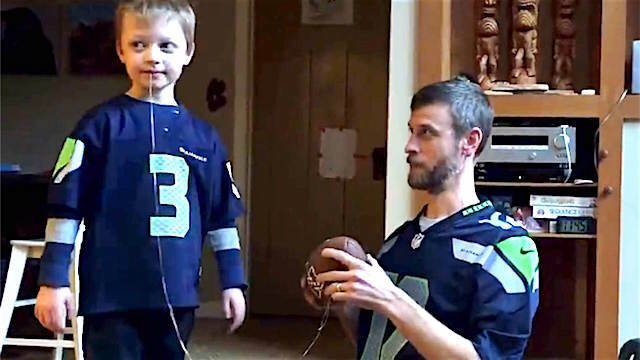 Dad then crossed the room and told him to make a pass just like his hero quarterback, Russell Wilson. The play worked — yanking Leo’s tooth out and sending it for a one or two-yard gain. His mom called it “the best play of the whole game” and Seahawks fans, reflecting on their season-ending, seven-point loss, might just have to agree. To to add some excitement to a tough first half, Seahawks vs. Panthers, we decided to do a tooth extraction- 12th Man Dentistry, Russell Wilson style.